Anterior crown fractures are a common form of injury that mainly affects children and adolescents. In the pre-adhesive era fractured teeth needed to be restored either with pin-retained inlays or cast restorations that sacrificed healthy tooth structure. Achieving aesthetic requirements were also a challenge for the clinicians. 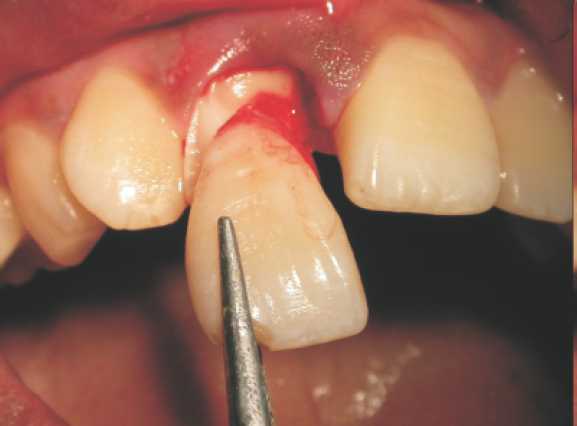 The development of adhesive dentistry has allowed dentists to use the broken fragment to restore the fractured tooth. 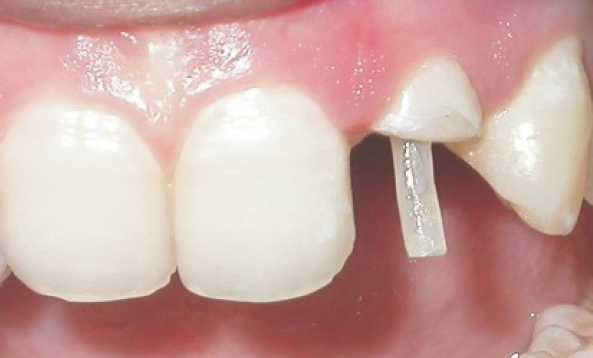 The acid etch adhesive technique may be used to restore function and esthetics of fractured anterior teeth. 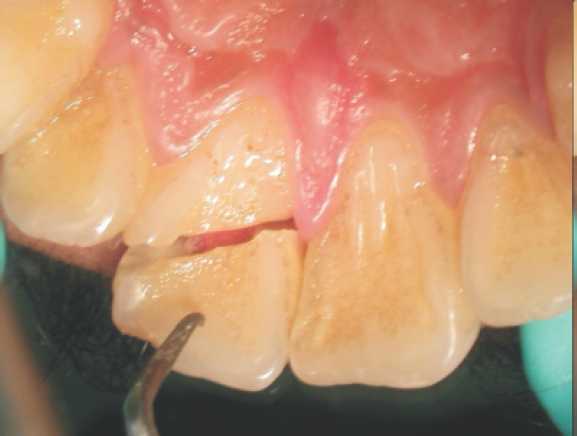 Reattachment of the fractured segment offers some advantages over composite restorations. 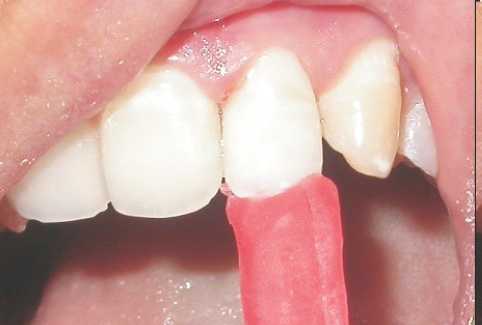 The original enamel translucency is maintained, and the incisal edge will wear at the same rate as the adjacent teeth. Esthetic, biologic and restorative problems may occur as a result of the fracture extending subgingivally and impinging on the biologic width. The treatment options depend on the relationship of the fracture to the alveolar crest, degree of pulpal involvement, amount of eruption, apex formation and esthetic requirement of the patient. This article presents two clinical reports describing the treatment modalities of patients who sustained fractures of maxillary anterior teeth due to trauma. traffic accidents and "at risk" athletic activities are usually the most common causes of dental trauma. 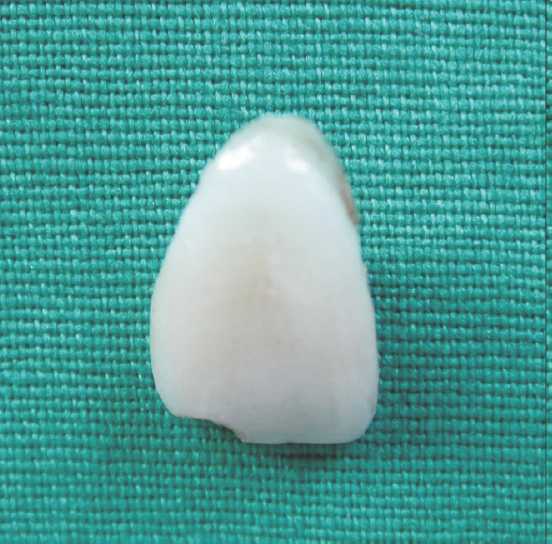 Reattachment of a tooth fragment is the first choice for restoring fractured teeth, whether or not the technique is combined with resin composites. 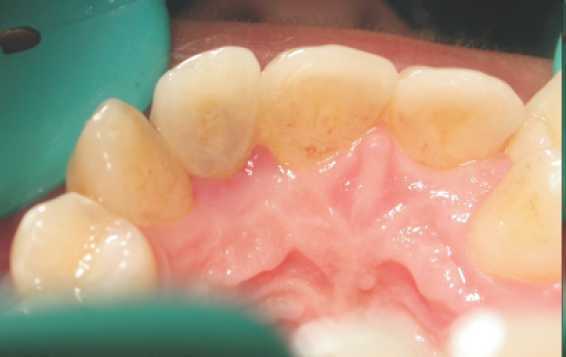 This treatment may offer several advantages over conventional acid-etch composite restoration. 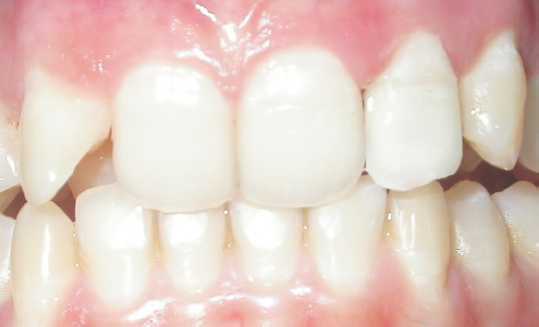 Improved esthetics is obtained since the enamel's original shape, color, brightness and surface texture are maintained. In addition, the incisal edge will wear at a rate similar to adjacent teeth, whereas a composite restoration will likely wear more rapidly. Furthermore, this technique can be less time-consuming and provide more predictable long-term appearance. These advantages of reattachment along with the shortcomings of composite buildup have led some clinicians to use tooth fragments from extracted teeth when the original is not available (Gabrielli & others, 1981; Santos & Bianchi, 1991; Busato & others, 1998)  . Different reattachment techniques involved are Enamel Beveling; V-shaped Internal Enamel Groove; Internal Dentin Groove; External Chamfer; Overcontour; Simple reattachment etc  . Treatment alternatives include crown lengthening to restore the biologic width, flap surgery and osteotomy/osteoplasty to restore biologic width, followed by crown reattachment and rapid orthodontic extrusion possibly in conjunction with fiberotomy  . 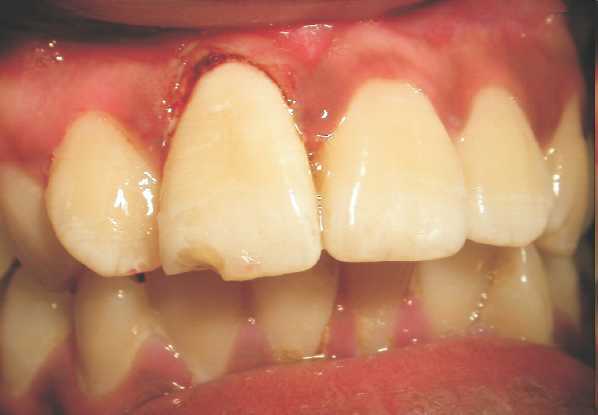 This article presents two clinical reports describing the treatment of patients who sustained fractures of the maxillary anterior teeth due to trauma. A 21 year old female reported to the department of conservative dentistry, B.V.P. Dental College, Pune. No evidence of alveolar bone fracture. Unfavorable  (plane of the fracture angle was cervical in a labial to lingual direction with no lingual support to the applied forces), complicated crown fracture of 22 (oblique fracture with fracture line extending subgingivally on the palatal side but without involving the biological width). The fractured coronal segment was highly mobile. Patient had mild pain during examination. [Figure 1], [Figure 2], [Figure 3], [Figure 4], [Figure 5], [Figure 6], [Figure 7], [Figure 8]. [Figure 9], [Figure 10], [Figure 11]. Complete root formation was evident. No extrusion of the root was seen. The pulp chamber of the fractured segment was cleaned and the segment was stored in saline. 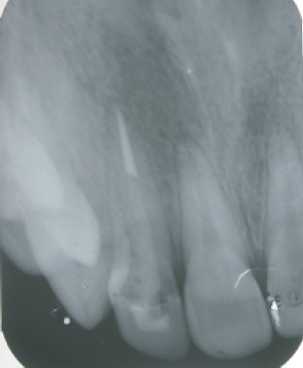 Root canal treatment for radicular portion was performed. 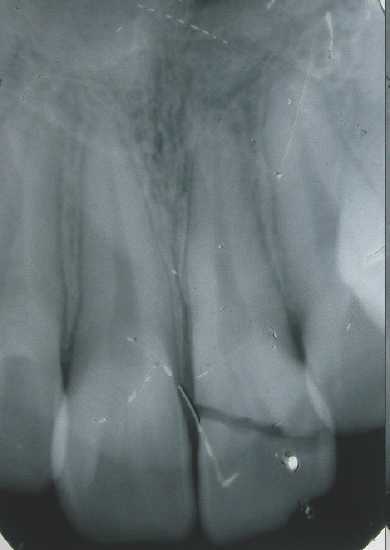 Canal was obturated with gutta-percha (sectional technique) and AH plus sealer. To expose the fractured margin on the root, the free gingival margin was selectively trimmed on palatal side by electro cauterization. Post-space was prepared at 16mm length and light transmitting post (DT post) was cemented with Panavia F dual cure resin cement. The fractured segment was reduced on the inner surface of the chamber to accommodate the fiber-post. Acid-etching was done for the fractured segment, fiber-post and remaining tooth structure. The fractured segment was reattached by using the selected shade of composite resin. 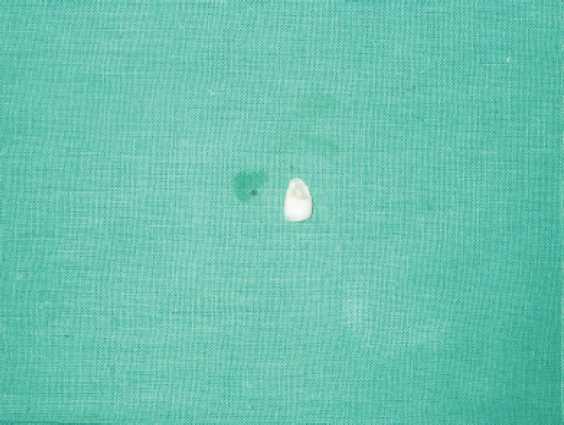 After bonding the fragment, a superficial preparation was placed on the labial surface extending about 2.5 mm coronally and apically from the fracture line. This area was then treated with a thin composite layer. This technique is useful when the fracture line is still evident after reattachment  . After final finishing and polishing the occlusion was evaluated. The patient was informed about the limitations of the technique and was asked to maintain the follow-up visits regularly. At a 15 month follow up after clinical and radiographic examination it was found that the palatal gingival surgical wound was completely healed and the patient was following the instructions and is very happy with the results. Extra-oral: Slight laceration of the lower lip. Favorable1 (Plane of the fracture angle was cervical in a lingual to labial direction with maximum lingual support to the applied forces), Complicated oblique crown fracture of 11. The fractured coronal segment was mobile. Patient had mild pain during examination. The pulp chamber of the fractured segment was cleaned and the segment was stored in saline. 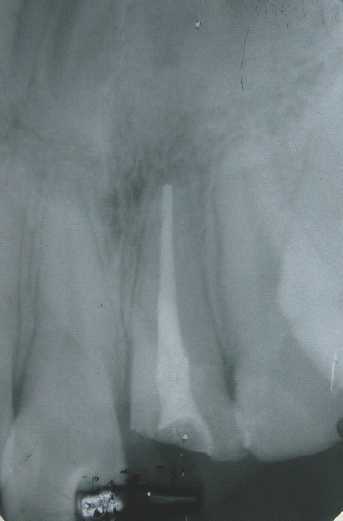 Root canal treatment for radicular portion was performed. 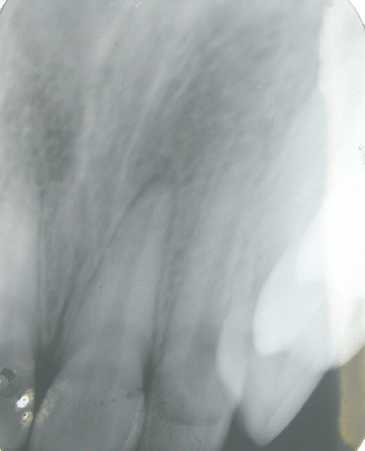 Canal was obturated with gutta-percha and AH plus sealer. 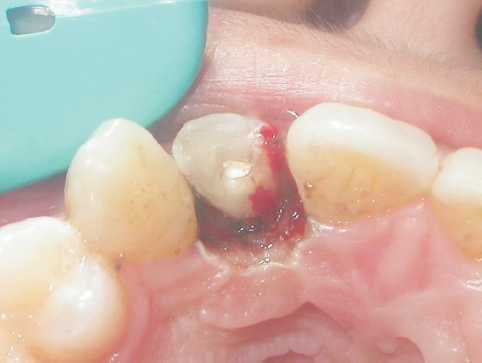 To expose the fractured margin on the root, the free gingival margin was selectively trimmed labially by electro cauterization. Post-space was prepared at 14mm length and light transmitting post (DT post) was cemented with Panavia F dual cure resin cement. The fractured segment was reduced on the inner surface of the chamber to accommodate the fiber-post. 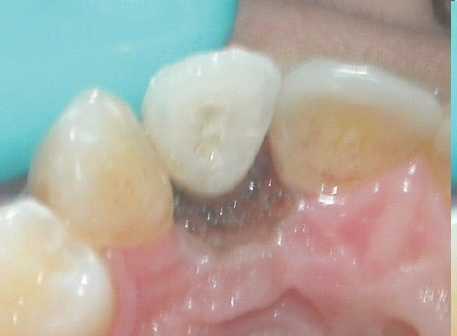 Acid-etching was done for the fractured segment, fiber-post and remaining tooth structure. Reattachment was done with Panavia F as per the instructions given by the manufacturer. The excess resin was removed gently with a polishing stone. When reattachment was completed, the occlusion was checked to avoid any premature and heavy occlusal contact on the junction of the attachment and the tooth. The patient was informed of the possibility that the fragment could detach again and was instructed to avoid excessive loading in that area. [Figure 12], [Figure 13], [Figure 14], [Figure 15], [Figure 16], [Figure 17], [Figure 18], [Figure 19], [Figure 20]. 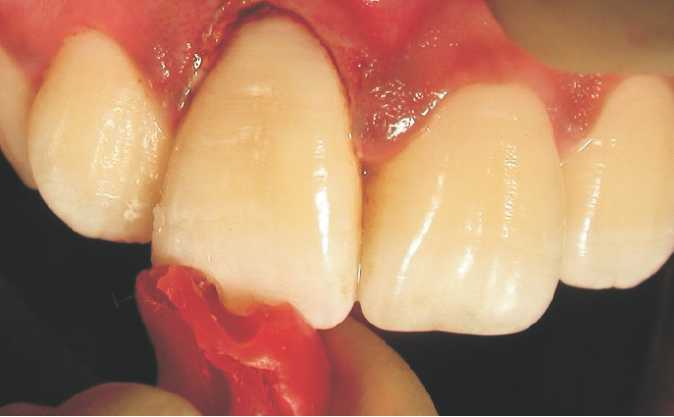 Reattachment of fractured clinical crown involving minimal or no invasion of biological width can be accomplished without conventional osteotomy and crown lengthening so that satisfactory esthetics can be achieved. 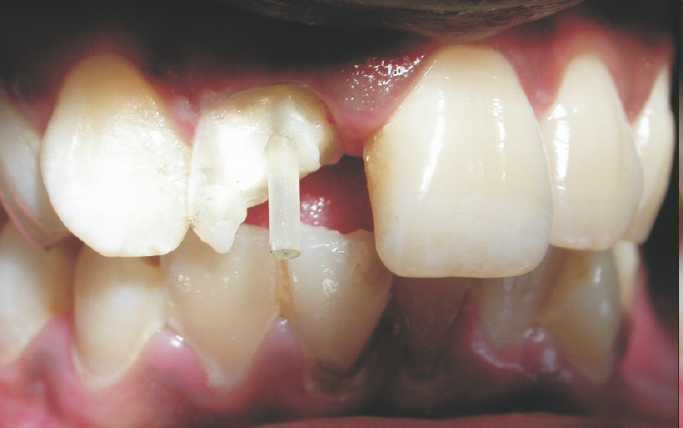 Adhesive techniques sometimes in conjunction with intracanal retention, with a post, can be used to reattach a fractured segment. An esthetic result can be obtained with minimal treatment and cost to the patient. 1. A Reis, AD Loguercio, A Kranl, E Matson. Reattachment of fractured teeth: A Review of literature regarding techniques and materials Journal of Operative dentistry 2004;29(2):226-33. 2. A Reis, C Francci, MRO Carrilho, LE Rodrigues Filho, AD Loguercio. 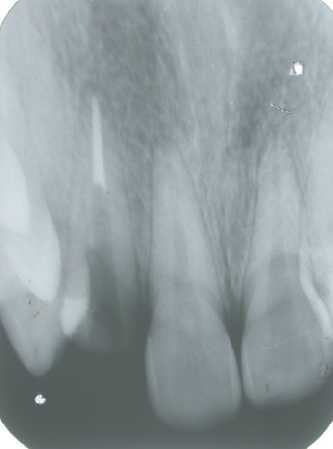 Reattachment of anterior fractured teeth: fracture strength using different techniques Journal of Operative dentistry 2001;26:287-94. 3. D. Trushkowsky. 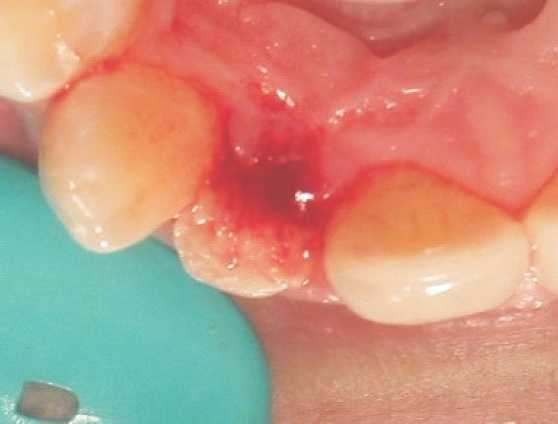 Esthetic, Biologic and restorative considerations in coronal segment reattachment for a fractured tooth a clinical report.